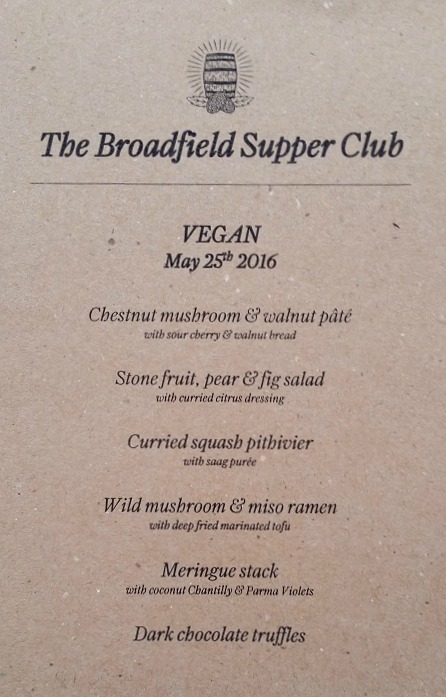 When we booked the Vegan Supper Club at The Broadfield in Sheffield it seemed ages off but it finally arrived. We’d originally tried to book for the Tuesday evening but that sold out in no time at all so they put on a second event on Wednesday evening which they also filled. Veganism is definitely on the rise 🙂 I’m not vegan but I love anything which means there are more ethical food choices available and just more variety in what’s on offer. And I can promise you that you did not have to be vegan to appreciate this 6-course feast. We had a set menu of 6 courses with the option of adding matched beers to each course. I was driving but my partner went for the beer option so I got to try them too. 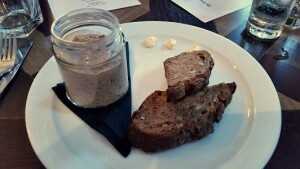 There were four of us and we all loved this first course of mushroom and walnut pate with sour cherry and walnut bread. I think it was my favourite savoury course and the bread was amazing. Really dark and crunchy. I’d like to find out what made it so dark because it didn’t have a coarse texture and it wasn’t heavy like some of the dark rye breads. It’s hard for me to judge this next course because I’m not a fan of fruit in savoury dishes and the idea of fruit in a salad with a curried citrus dressing is too reminiscent for me of that strange old habit of putting sultanas in curry. It’s just not for me. 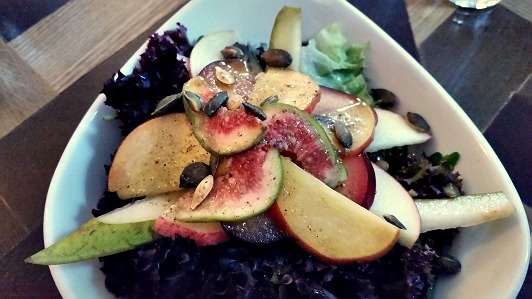 Having said that I did eat this course and I enjoyed the variety of fruit and the mixed salad leaves in the bottom with the dressing – I’d just prefer it not all in the same bowl! It was however a good call to have a light refreshing course. Next came a dish I’d been very intrigued by, a curried squash pithivier. 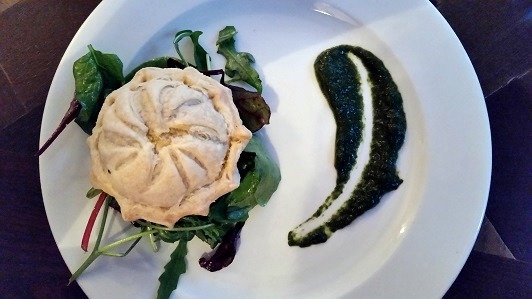 I associate pithiviers with French cooking rather than curry flavours but this was lovely. The flavouring was great and if you think of it as combining a pasty with curry, well what a good idea 🙂 My only minor complaint would be that I’d have liked a higher filling to pastry ratio. I loved the spinach puree as well. It was only a small amount but it really packed a punch flavour-wise. I often have spinach curry if we’re at an Indian restaurant and this was like all of those flavours concentrated. The last of the savoury courses was a miso ramen. I enjoyed this overall but there were mixed feelings in our group and I think it was the least loved dish of the night. 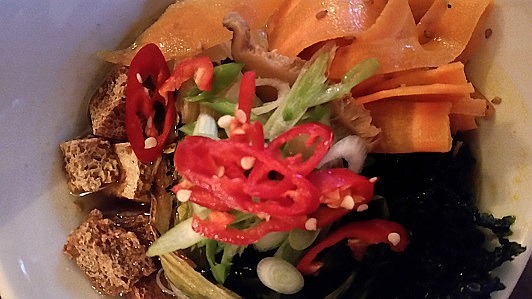 I really liked the selection of veg in it, the carrot ribbons which I think had been marinated in ginger were amazing and the fine noodles in the miso broth were good … but I didn’t like the way the tofu had been prepared and the seaweed was just a bit too seaweed-y! I’ve been thinking of eating more seaweed because I have an underactive thyroid and seaweed is a good source of iodine but I think I’ll have to shop around for one I like more. In the language of the Great British Bake Off, this was definitely the showstopper of the evening. 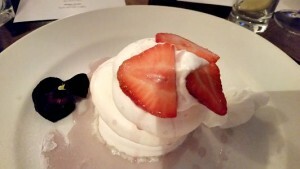 Vegan meringue (it would be reasonable of you to ask how that is even possible!) with strawberries, parma violet syrup and parma violet dust. Oh and it was decorated with beautiful pansies. I don’t love parma violets but they worked really well in this form and for those of you who are big fans apparently it was made by grinding up parma violet sweets and it looks like you can buy 6kg for the price of 4kg at the moment! Back to the meringue. It was amazing. Sweet, light, crunchy on the outside, softer inside, all the things a meringue should be. Apparently the magic ingredient is the liquid from canned chickpeas so I’m going to have a go at the weekend. 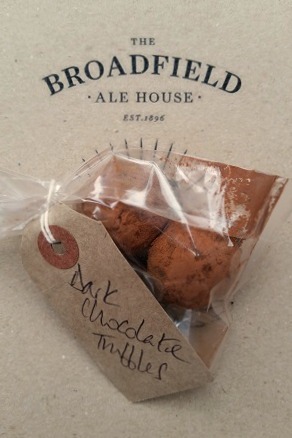 Finally, we got to our sixth course, the end of our fantastic meal, homemade dark chocolate truffles which were very thoughtfully presented in a little bag just in case we were full by that point! Overall, a wonderful meal with lots of different flavours and ideas that I’ll play with at home. I will definitely be looking out for the next one. Fingers crossed my meringues come out like theirs! Right, sorry if I’ve rambled on a bit but I do love talking about food 🙂 If you like my ramblings please sign up for my veggie newsletter for more vegetarian inspiration and ideas.